Here you will find the most common questions and answers for you to learn more about the North Dakota State High School Clay Target League. If you have a question that is not listed, visit our Contact Us page and submit it to us. We’ll get back to you right away. Click on a question to expand and reveal the answer. What student is eligible to participate? Students must be in grades six through twelve (or per school team requirements) and possess a league-approved firearm education certificate. How long is the spring season? The spring league is nine weeks starting in early-April. The State Tournament is in June. Can a physically disabled student participate? Yes. Many shooting ranges are handicap accessible. Can boys and girls participate? Yes. This is the only high school sport that can host co-ed and adaptive student athletes. Can a parent or student start a team? Yes. Ask school administrators to provide the process and requirements to add an activity to the school. Then visit the League’s website and select the “Start A Team” page and follow the instructions to acquire the interactive presentation to learn more. Make sure you understand the school’s approval schedule and requirements so you can receive the approval and setup the team prior to the March student athlete registration deadline. If my school does not have a clay target team, can I join another team? Yes. The League requires a cooperative agreement signed by the Athletic/Activities Director at each school. It is strongly encouraged to attempt to start a team in the student’s school. About $230. The fee varies slightly for each team depending on ammunition and target costs from the teams local shooting range. Some teams may also include uniforms. A $35 fee is paid to the League for administration costs associated with operations, awards and insurance. An annual four-issue subscription to the League’s PullUSA Magazine is also included. Some school teams are sponsored by local businesses and organizations to help pay for costs. The State Tournament participation fee is not included in the team cost. How do I register to be a member on a team? Through the team. Contact the school or the Head Coach of the clay target team to learn more about the requirements to become a member. The team administrator will send a registration invitation via email to the family to register the student for the League through the online registration process. Registration begins in January and ends in March. See the schedule for the exact dates. What kind of firearm safety training is required for students to participate in the League? All student athletes are required to complete and submit certificates for either one of two League-approved firearm safety certification programs – a state-approved hunter education certificate or the League’s SAFE certificate. Teams should verify the firearm safety training certification requirements with the shooting range where they will be conducting League events. View certification details by visiting the firearms safety training page under the Rules section on this website. Do I need to possess a shotgun to participate? Yes. Some gun clubs may have shotguns to borrow or rent with parent/guardian permission required. Can I use the League’s SAFE Certification to hunt? No. The state requires a state-issued hunter education certificate for hunting. Can any student participate in the State Tournament? Yes. The State Tournament occurs in June and every League participant is invited to attend. Participants compete against student athletes in classifications based on similar shooting abilities determined by their season average score. The participation fee for the State Tournament is $30 which includes targets and a t-shirt. Participants are responsible for providing their own ammunition. Do I or my school team have to join any other organizations to participate in the League? No. No school or any student in a school shall be required to join an outside organization in order to participate in a school event. Can a team not associated with the school participate? No. All teams must be approved by the high school and use the school name. Yes. As long as there is a team within the same school district as the student, there is room on the team, and the school allows it. How safe is clay target shooting? The League is the safest sport in high school. With more than 30,000 student athletes that have participated in more than 330,000 events that have shot more than 20 million times, there has been no reported injuries since the League started in 2001. The League uses the True Team® scoring method which emphasizes the top overall team performance, rather than top individuals. This type of scoring is similar to high school swimming and track. Check the League’s website for more details about True Team® scoring. Is competition focused on the individual or team? Team. Individual performance contributes to the team’s performance. Upon completion of the league, high round averages for the top male and female in each conference are recognized. Otherwise all scores contribute to the team’s overall performance and team conference champions are recognized at the end of the League’s season. Do I have to travel to other shooting ranges to compete? No. Competition occurs at the local shooting range. Scores are submitted by the coaches on the League’s website and compared against other schools’ scores within the conference. Can I participate in other high schools sports? Yes. The League allows teams to shoot up to two days a week (including weekends) which provides most participants the flexibility to work around practices and games of other sports and/or activities. Can a student athlete complete a weekly event on a different day than the one their team is scheduled to shoot? No. Student athletes are required to shoot when the team is scheduled to shoot. Is there a student scholarship available? Yes. Senior student athletes who are pursuing post-secondary education in environmental sciences or natural resources can apply for a scholarship available from the League. How do athletes and families track performance? Each athlete receives access to the Shooter Performance Tracker® – a web-based application to monitor an athlete’s scoring and progress rankings that are compared against their team, conference, and all other student athletes in the state. 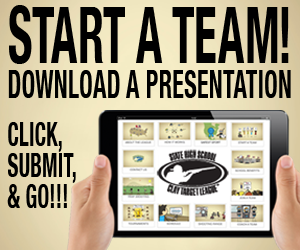 Visit the League’s website and go to the “Start A Team” page and follow the instructions to acquire the interactive presentation to learn more. Talk to your local shooting range about available shooting days and time, costs, and volunteer assistance. Host a meeting at the school and invite students and parents to learn more about the opportunity and sign up for the team. Notify the League and you are good to go! How many students make up a team? Five students is the minimum number for a team. There is no maximum number of students that can be on a team. There may be some limitations to team size because of coaching resources and/or shooting range capacity. Is the League a sport or an activity? Both. Clay target shooting is an Olympic sport that is identified as an “activity” or “club” at the high school level. In most cases, a high school identifies their “sports” as a varsity sport officially recognized by the state high school athletic/activities association. Is this activity Title IX compliant? Yes. All students have an equal opportunity to participate and must adhere to the same rules. By team size – not geography or school size. Typically, a team will double the number of members following the first year. By using team size, competition is fair using the League’s True Team® scoring method. Do teams conduct tryouts for athletes? Rarely. The League encourages equal opportunity to offer this activity to as many athletes as the team can allow safely and efficiently. What factors limit a team size? Typical items include shooting facility capacity (available days and number of shooting fields) and coaches (1:10 coach to athlete ratio). After cutting many student services, how does a school justify adding this new activity? This is the only activity that compliments the school district’s mission; provides equal opportunity to all students; is safe and affordable for families; and there is no funding, facilities or maintenance required for the school. Do schools offer a lettering program or yearbook inclusion for this activity? Yes. Although it is not required, the League recommends that the student athletes be recognized similar to other athletes in other sports. The League provides lettering recommendations on the website. Can we combine smaller schools to make one team? Yes. A cooperative agreement between schools is required if there is no current cooperative agreement with other sports in use. How much does it cost the school to participate? $0. All costs are paid for by the student athletes. Is this League a sanctioned sport with the state high school athletic/activities association? No. Although the League follows similar beliefs and operations as the state high school athletic/activities association, this is not a sanctioned sport. That’s why teams are designated as an activity or club. The League’s goal is to have the state high school athletic/activities association recognize and support a State Tournament similar to other high school sports. This is typically achieved with a high number of participation of member schools, a track record of success, and a formal presentation and approval from the state high school athletic/activities association’s board of directors. Are students or schools at risk of violating our gun-free zone policy? No. The student athletes follow the same state law as all other students. Students must either go home after school and get their firearm and ammunition or have a parent or someone else bring the items to the shooting range for them. Some shooting ranges offer on-site gun safes to store the guns for the student athletes. How do schools across the state compete? Virtually. The League groups schools by team member size in conferences. Each team competes against all teams within their own conference. 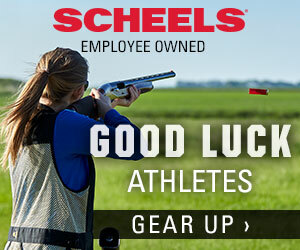 School teams shoot at their local shooting range and submit their scores online to the League. Weekly scores, results, top performers and overall standings are posted on the website so everyone can see how their school fares with others across the state. How much staff time, transportation, or facilities are required by the school to support the team? None. No administration assistance is required because coaches manage the entire team and the League provides online resources and guidance to manage the team. Transportation to the shooting ranges is arranged by student, families and coaches. Are shooting sports an Olympic sport? Yes. Shooting sports have been an Olympic event since 1896. The USA Shooting Team offers Olympic and Paralympic events. How many colleges have shooting sport teams? Over 500. Many offer scholarships to student athletes. Are athletes expected to adhere to all school policies? Yes. The League fully supports all school and activity policies regarding participation, academic, and ethical requirements. Yes. Registered student athletes receive accident insurance and each registered coach and volunteer receives liability insurance policy from the League. There is no additional cost for the insurance coverage. What is the most popular way to setup a team? As a club activity. The League provides the tools and resources so the team can be self-sustaining and school involvement can be as much, or as little, as they prefer. What is the number one priority in the League? What is the best way to measure the level of interest of our students before we approve the formation of the team? Promote and host an informational meeting at the school. Coaches, League officials and gun club members can help define and present the concept for a new team. The school can then measure the level of interest based on attendance and preliminary sign-up of students. What is required for a school to join the League? The League requires a formal approval from a school official (AD, Principal, Superintendent or School Board) and permission to use the high school name for the team. It is recommended, but not required, to offer the athletes a lettering program and recognition in the school’s yearbook. If I agree to be the team coach, will the shooting range help me with the athletes? Yes. Shooting range members are terrific volunteers and community support ambassadors. They have many years of experience in shooting sports and the safe handling of firearms and ammunition. Can the students shoot more practice rounds on their own? Yes. It’s no different than a member of the golf team going to the driving range and hitting a bucket of balls or a member of the baseball team visiting the batting cage. The more a student athlete puts into honing their skills, the more they’ll get out of it. The League requires one coach for every 10 student athletes. The League averages one coach for every four student athletes. Approximately 99% of League coaches are volunteers. Some schools have coaching compensation policies for education-based activities. How do student athletes register on the team? After a coach adds a team member to the team’s roster, a registration invitation will be automatically generated and emailed to the parents to access athlete registration. Parents will go to the athlete registration website and complete the registration process. All athletes are required to register. Do I need to be a certified instructor to be the head coach? No. All coaches on a team will strive to develop in each athlete the qualities of leadership, initiative, fine judgment, and good citizenship. Official shooting sport coach certification is not required for any coaches. The school is responsible for approval of the head coach and the school may require background screening for all coaches and volunteers. Background screening is available through the League for a nominal fee. The League provides online certification training for all head coaches for free. Other coaches are provided the opportunity to complete the certification for a nominal fee. It is required that a coach and a Range Safety Officer (RSO) be present every time a student athlete participates in a League event (practice or competition). What does the League do to help coaches? Everything. The League provides marketing materials, presentations, references, and knowledge to any and all coaches to assist with any team. The League also provides a proprietary web-based tool that manages the registration of members, member contact information, tournament registration and more. A Coach Education and Support Manager is available to help with any questions or to provide advanced training to coaches and teams. The usaclaytargetcoach.com website is a dedicated education and support program to help coaches of new teams, growing teams and emerging teams. Coaching support is ALWAYS available.